Does your dog exhibit the traits of an aggressive dog? Aggressive dogs may be the the hardest, of all of the personality types, to handle, especially around other dogs. Don’t be fooled by breed, dogs of any breed can be aggressive dogs. The aggressive type of dog tends to be extremely dominant. They want to resist human leadership, and need a firm owner/handler. Aggressive dogs are usually not for the weak willed owner, or the first time dog owner. A dog with the aggressive personality type can easily be provoked into going into an offensive mode against both other dogs and humans, sometimes resulting in biting. They require consistent and strict training. Give them an inch and they’ll take a mile. Generally intelligent, fast learners and often chosen as livestock guard dogs, or in military and police work. Dog with the aggressive personality type can be trained to be wonderful protectors. Left untrained and un-socialized, though, they can become quite a handful. Aggressive dogs need a strong willed leader. During training you need to use a loud strong voice, without yelling, and your demeanor should be firm. Always be on the lookout for any attempt by an aggressive dog to try and exert their desires over yours, and put an end to it in a firm, but not punishing manner. Aggressive dogs tend to be incompatible with other aggressive, confident, outgoing or insecure personality type dogs. Dogs with an aggressive personality can be compatible with the independent personality type, or at least may tolerate each other if they have enough room to feel comfortable. But they most likely will not form close bonds, or spend much time together. Aggressive dogs can also be compatible with adaptable personality type dogs, due to the adaptable’s submissive nature. Again, close bonds between the canines are not likely to form. We have one dog in our pack with the aggressive personality type. Ironically enough, she’s the smallest dog among the permanent residents here. We’ve employed the use of a [amazon_textlink asin=’B074PP2QX6′ text=’muzzle’ template=’ProductLink’ store=’fosterpack-20′ marketplace=’US’ link_id=’71ce48e5-4cc6-11e8-a127-cd76fa7539aa’], when we have to have her around the other dogs that she doesn’t particularly like. 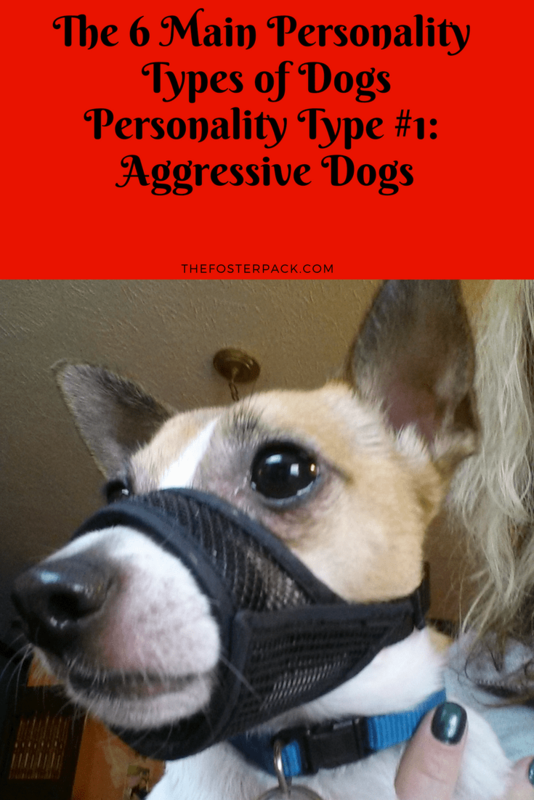 Do you have a dog with an aggressive personality type? How do you deal with them?